Miracle Treat Day Celebrated at Children's Village – Dairy Queen Corp. 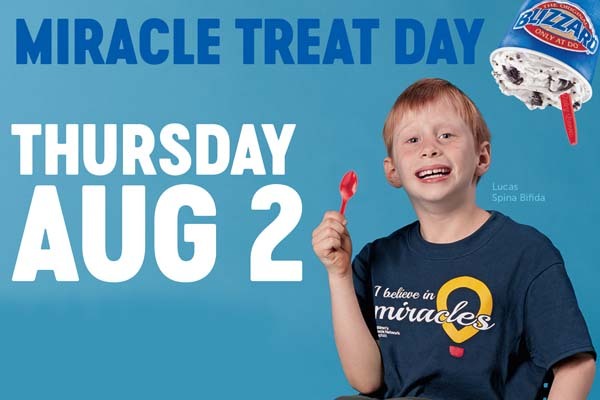 This Thursday, August 2, is Miracle Treat Day celebrated at our local Dairy Queen restaurants. On Thursday, $1 from every Blizzard Treat purchased is donated to Children’s Miracle Network, which supports Children’s Village and Virginia Mason Memorial’s NICU and Pediatric Unit. This year, patients and staff are in for a special treat: The West Valley Dairy Queen will be onsite at the playground behind Children’s Village from 10:30-11:30am handing out FREE Blizzards to patients, their families, and our hospital staff! There will only be 500 Blizzard Treats available to be handed out, so don’t wait too long to pick up yours. If you have any questions, please reach out to Josh Munson with The Memorial Foundation at 509-249-5261 or JoshuaMunson@yvmh.org. Previous post: (Miracle) TREAT YOURSELF!